Product #21899 | SKU BLX14/CVL | 0.0 (no ratings yet) Thanks for your rating! 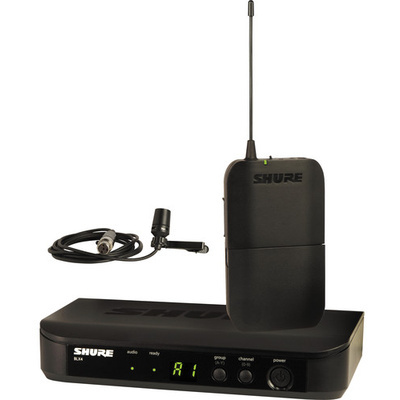 The BLX14/CVL Lavalier Wireless Microphone System from Shure includes a BLX4 single-channel wireless receiver, a BLX1 bodypack transmitter, and a CVL Centraverse clip-on lavalier mic. The system is set to Shure's M15 frequency band and operates between 662 - 686 MHz. The BLX1 bodypack transmitter has a 300' line of sight operation range with the BLX4 receiver. It is powered by two included AA batteries that can provide up to 14 hours of operation. The BLX4 receiver features microprocessor-controlled internal antenna diversity that helps prevent interference and signal dropouts. Its one-touch QuickScan feature detects the most interference-free frequency and sets the channel to it for fast setup.